Bonney was born in Strand, Western Cape. He studied analytical chemistry at Natal Technikon and later became an artist under the guidance of Hannes du Plessis. He lives and works in Clarens in the eastern Free State. 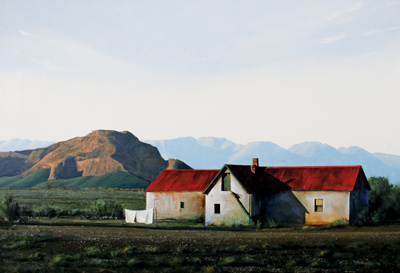 Bonney loves our very unique South African landscape, particularly the silence and remoteness of the Karoo regions. He says those faraway places are littered with 'intrusions' that speak so eloquently of humanity and human presence without human beings necessarily being present – the deserted farmstead, the dilapidated shed, the crumbling grain silo, the rusty relic of an old truck or tractor. Decaying windmills clanking in the breeze. "I guess I am a confirmed nostalgic, so for me the mystery and story and questions (even the sadness) behind these symbols of an absent humanity and a bygone era, are as important a part of our landscape and my paintings, as is the natural beauty of misty mountains, long shadows and big skies."